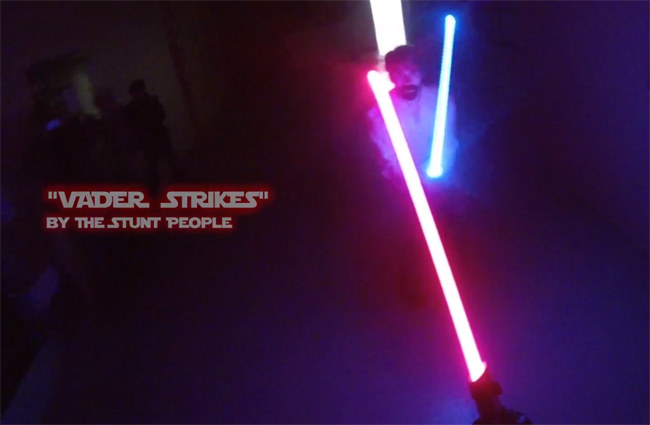 The Stunt People, have created an awesome first person lightsaber Darth Vader battle called Vader Strikes which they have released on to YouTube this week. The Vader Strikes video has been created using modified Hasbro Force FX sabers, removing the LED strips within the Hasbro Force FX saber and replacing them with a single LED in the blade holder. Watch the awesome first-person Vader Strikes lightsaber battle after the jump. For more information on the awesome Vader Strikes first person light sabre battle and how it was created, The Stunt People team have published another video onto YouTube showing a behind the scenes look at how the battle was created, and you can expected a sequel to be released in the near future, say The Stunt People.